I have decided that because I am old, broken and very tired, on Oct. 1, 2015 I will be retiring as “Fearless Leader” of Eye of the Storm. In the next four and a half years most of the horses I have pledged my life to care for, will be taken by their angels. They are all in the twenties. I will have fulfilled my obligation to them. All that will be left of the original group will be most of the ponies, Baby Faith, and hopefully my own horse Fancy, though she will be twenty-eight at that time. I will still be an active member of the organization as executive director for a while longer. I will continue to share the things I have learned here as a life-long “horse observer”. But the physical stuff is just getting to be too much. I was always afraid to let go. Who would carry on this work? How could EOTS go on without me? I have had many volunteers come and go. Most have gone on to bigger and better things. But one has stayed with me since she was fourteen years old. She is the only one who has absorbed everything I have ever tried to teach. She is my apprentice. She is the only one in all these years that understands the point I have tried to make. She has become an extension of me, though a much nicer person than I am. She is now twenty-one years old. Eye of the Storm will live on. And so my friend Jessica M. will be taking over the reins. I am so relieved to know that I have such a one to carry on this precious work, that the circle of EOTS will be safe. Our program will be refined and changed a bit in the hands of modern young people, but only for the better, as I have been left behind in this technical era. So much more will be accomplished without me in charge. In the meantime, stalls must be cleaned, horses cared for, and money still needed to buy feed, bedding, vet and hoof trimming. Our educating horse owners about responsibility to their horses for life continues. This is the “dry period” for us. The only money coming in is from donations from you. We need your help right now. I thank you for all of your past support and I hate begging for money from friends, but the horses must be fed. And so, I introduce to you, Jessica. Please Jess tell a little about yourself. Nice to meet you! I’m Jessica M. I’ve been volunteering at Eye of the Storm for the past seven, very eventful years of my life. Though I’ve been to many different barns and have begun working at numerous more, EOTS is where I learned almost everything I know about horses on the ground. When I was a child I made the decision to stop taking riding lessons and start volunteering at a rescue, I never imagined how much more I’d learn just working with horses. Horses have a lot to teach, and Nina has a life full of horse observing to pass on to me. In the past seven years I’ve seen horses come and go in all ways. I have many a sad story to tell about the horses at EOTS and their sad passing’s, but I’d rather tell you about the joys of new arrivals and breakthroughs in recoveries. I remember holding Czardas’s head through her experimental surgery in her hoof. I remember the first time going out on a trail ride on Solomon (what a thrill!). Oh! And my favorite arrival day was the day Nina greeted me in the driveway and brought me to a stall that was previously empty. She motioned to be quiet as she opened the top door. Out came this beautiful pink Spanish horse who preceded to reach down and drink a gulp of my iced coffee! Through my time at EOTS I’ve learned there is so much more to horses than anyone could guess. They are each individual loving creatures. I’ve learned all the basics of daily care for the horses. How to measure feeds, which feeds different horses need including the supplements. I’ve learned how to tell when something is wrong, and then how to translate horse to human what the problem is (though it often takes us silly humans a few guesses while the horse impatiently waits for us to get it right). I’m now going on to learn things about how to write grants and how to fund-raise. I’ve been working the past few years driving horse drawn carriage tours and I’ve discovered how much I love teaching people the wonderful things about horses! So I did a 6 month internship and acquired my Mass State Riding instructor’s license, teaching kids who love horses all the interesting, different things about horses is a ton of fun. During this internship the riding school I interned at also offered therapeutic lessons on a different day, I loved this. So I began interning with that group of students. Students with special needs get something more out of riding and working with horses, I think, more than anyone could understand. Horses provide self confidence, physical coordination, they help teach students to focus and think before they act, they help students control impulses and all in a very positive and exciting way! I just love working with these students. I long thought how wonderful it would be to see horses who have come from hard situations helping students who have come from equally difficult situations. This has become my dream. 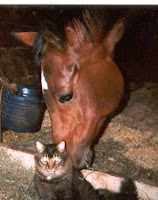 My dream is to carry on Nina’s work at EOTS where we will continue to take in horses who need rescuing or sanctuary. But I would like to add on to that and help humans who need it as well. I’m currently working on my NARHA therapeutic riding instructor license so I can continue to learn more about different special needs students. In the meantime we have begun the transition of EOTS with our newest rescue. His current name is Mr. Baby Pony, we hope he will tell us his real name as he grows up. He is a one year old Gypsy Vanner/Shetland pony cross, in other words, he’s adorable! Not just that, his conformation and attitude is perfect for a therapy horse. I’m in the process of making a blog following his progress (link coming soon). And so I am Jessica, Nina’s friend and apprentice, and I hope to make EOTS even more wonderful than it already is. I want to make EOTS a sanctuary for horses and humans alike. Please see the donation button on the left to help support Solomon. Whoever said there are no more heroes? I found lots of heroes on August 22, 2001 when we had to lift a crippled horse from an eleven-ton crane in a last-ditch effort to save her life. It is an extraordinary story, and I'm going to do my best to tell it to you here. It all started when the mare, Faith, stepped on a nail at a barn in New Hampshire. 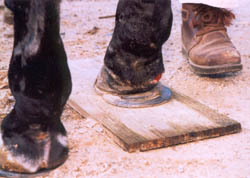 Because of the rubbery structure called a frog in the sole of the hoof, the nail became embedded. Faith became very lame, but the nail was not visible, even to the farrier who removed her shoes. So, there the nail stayed for two weeks. When it was finally discovered, Faith was brought to the Rochester Veterinary Clinic where the infected wound was operated on. The wound healed beautifully after stall rest and "big-gun" antibiotics at Eye of the Storm, where she was brought to recuperate. Faith was finally ready to be turned out for a few minutes. In those few minutes, without doing anything foolish like bucking or leaping into the air, she ruptured her deep flexor tendon and came back to her stall on three legs. We suspect the tendon let go where it passes over the navicular bone deep inside the heel of her hoof. It is a very serious injury. This beautiful, loving friend, who is only eight years old, will probably never be sound enough to be ridden again. According to the vets and the MSPCA team, Roger Lauze and Joe Silva, the prognosis was so poor that they all advised us to put her down. Her owner, as well as the rest of us were convinced that that was probably the best thing to do. 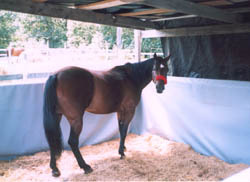 Keeping her alive meant stall rest for at least a year and no guarantees that she would ever bear weight on that leg again. The chances were good that her weight-bearing leg would break down and her quality of life would be poor. Putting her down seemed like the only option -- at the time. Lindsey Robbins, our vet, was going away for a week and there was no hurry to put Faith down. That gave us time to say good-bye. We had placed a soft cast on Faith that helped stabilize her leg. We had originally ordered a device called a Kimsey splint when the tendon injury had first occurred but were advised not to use it as the vets did not feel that it would help. After watching Faith's wretched hoof flop around for a whole day after her "appointment with destiny" had been scheduled, I decided that I could not sit there and do nothing. I put on the Kimsey splint. And it worked! The toe still pointed up somewhat, but she was bearing weight on that leg and the hoof was held firmly in place. It would not heal properly in that position, but it could not get any worse, either. I had seven days to prove to everyone that this horse needed to live, that she wanted to live. Steve, my right-hand man, got on the Internet until the wee hours of the morning searching for someone who had successfully treated this kind of injury. 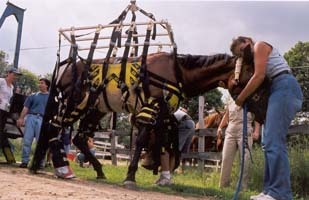 He contacted Dr. Bramlage from the Rood and Riddle Veterinary hospital in Kentucky, where the doctor treats race horses with incredible leg injuries. Dr. Bramlage sent back a letter of hope. Just a teeny hope, but it was all we needed. He said it was possible for that kind of injury to heal enough that a horse wander around in a pasture as a companion, but would probably never be sound again. But that was all we needed! The hamster in my brain began running in his little wheel and the ideas began to flow. We needed to try one more thing. In the meantime, oblivious to the fact that she had only days to live, Faith vacuumed up every morsel of food we fed her and hollered for more. She got a little bit spoiled that week when we all thought she was going to die. Poor Vanessa, Faith's young owner, was emotionally exhausted from the strain. She had bought Faith to be her best friend and companion for many years to come, only to have this awful tragedy take place. In her heart she had already said good-bye to Faith and had been trying hard to stick with her own decision. My heart aches for her; I know how she felt. It's a terrible thing to have to make this decision. But I could no longer support it. One by one, everyone else started to see things my way. We had one last chance. I always tell people that miracles happen at Eye of the Storm. We had seven days to find one. It is very difficult for people who don't own their own barn to be able to afford to keep an unrideable horse. Board is expensive, and when you have to board a horse with permanent injuries like Faith's, it can be financially devastating. A considerable amount of money was spent at Rochester Veterinary Clinic for Faith's surgery and she would need to continue to be boarded somewhere. After her tendon ruptured this became a very real problem, as it was obvious that her riding days were over. The situation was rapidly becoming a terrible financial burden. Our miracle arrived in the form of a $2,000 anonymous donation for the purpose of saving Faith. And so, with renewed vigor, that's what we did! Throughout all of this, I had been praying for guidance and wisdom. Steve and I would stand, holding Faith, and pray for a way to save her. God so loves his creation and horses are so special. And so, most of all Jehovah, I thank you. There is no doubt you were with us that day because everything was perfect. After discussing things with our farrier, Dave, we decided that her original shoes needed to come off as her hooves had grown very long. 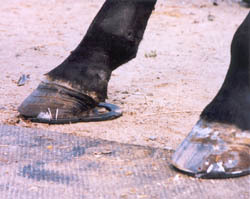 A special shoe with an extension off the heel might work to support the back of her leg and set the toe back on the ground so the tendon could begin to heal in the proper position. The idea was good, but we were confronted with the problem of how we could get her to stand on her injured leg while Dave worked on the other one. We knew that the only way was to lift her in a way that took all weight from her feet. Enter Ricky Marshall, owner of Astro Crane. Some people you can just mention a situation to and they find a solution. Ricky is one of those people. He donated one of his cranes to us for what turned out to be an entire day. Talk about the proper tool for the job! August 22 was a clear, hot day. Everyone arrived at around 1:00 PM and went to work. The crane was set in place. Roger from the MSPCA set the sling, an impressive array of straps and hardware, out on the ground. Strangely, my biggest worry was walking Faith out over two six-inch door sills. I lost sleep over it. I wasn't worried that she would be hung unconscious from a crane wearing a very uncomfortable outfit. Not that when her shoes finally came off maybe they couldn't fix her after all. None of that. Only that I needed to get her over the door sills. Perhaps it was because that there, my part would be over, that the last thing I might ever do for her was to get her safely over two door sills. After that she would be in the hands of others much more capable than I. It's funny looking back at our own thoughts. I was prepared to lift her whole rear quarter over the sill and stood waiting But guess what? She did it just fine. The Kimsey splint held her poor foot in place and she stepped right over those sills without my help. Roger came over and began to put the sling on her. We had done so many awful things to this poor mare for three months yet she never twitched a whisker -- such a brave and beautiful girl. Lindsey tranquilized her. When the drugs took effect we hooked the sling to the crane. At the controls of the crane, Matt slowly began to lift her off her feet. I held her head and kissed her velvet ears. As I held her head against my chest I felt a very strange energy passing between us. I couldn't tell if it originated from me or her. I only know that I held the weight of her head for a very long time and didn't notice. I have very bad fibromyalgia and my right arm is a mess, but I felt no pain. We have 15 other horses and for three hours not one of them made a single peep. But they were all watching. Possibly the energy I felt came from them as they helped us succeed; they were all with us. I found myself crying. I got Faith's ears very wet as I prayed into them and told her how loved she is. The energy flowed, and we succeeded. Dave, bless his heart, had the hardest job of all. Horseshoeing is backbreaking work under the best of circumstances. He worked under the hardest conditions possible that day. The sweat poured off him and we wiped his face with wet cloths as he struggled under our broken horse. It was very hot. Roger kept saying "I wish we could do something to help you." But we couldn't. All we could do was wipe the sweat from his eyes. And so it was done. Our beautiful broken girl was set back on her feet. As she came back to full consciousness she stood firmly on all four feet! Our wonderful farrier saved Faith's life. Dave always believed. When all the vets felt there was no hope, Dave had hope and he saved her life. I will always be grateful, he also believed in me because I also knew we would save her. This was a terrible injury and we have no idea how things will go. As far as we know, no horse has ever had the exact same problem. I only know that until she tells me she's had enough, I will never give up on her. As of March 2002, she has steadily improved and is now walking firmly without a limp. If anything, she has become a hazard to herself, in that now that she is no longer in pain she wants to leap and buck and play. If we can keep her from reinjuring herself for just a while longer, until the scar tissue hardens up, she will run and play again! She will remain here for the rest of her life. She now belongs to us. Faith and I have become very good friends as we have spent a considerable amount of time together and I don't give up on my friends. Our ultimate goal is to move to a farm with a field of grass where all our old and unsound horses can spend all of their days hanging out together in peace. We love and honor these beings as our friends here at Eye of the Storm. We love their positive energy and their powerful spirits. We love them. And Faith will be there, in that field of grass with her good friend Noogie (who is probably going to live forever). And so, the final hero in this story is Faith herself. She is my hero. Thank you Faith! I want to thank Ricky Marshall and his crew of crane operators at Astro Welding and Crane Company. Special thanks go to Matt who operated the crane when Eye of the Storm Equine Rescue needed to lift a crippled mare off her feet to replace her shoes. Deepest appreciation goes to Joe Silva and Roger Lauze from the MSPCA and Nevins Farm for bringing their sling, which we used to suspend the mare from the crane. Thank you Lindsey Robbins, our vet and dear friend, armed with a steady stream of tranquilizers to put the horse into a state of semi-consciousness while Dave Atkinson, our star-of-the-day farrier, replaced her shoes. Thank you all! It took a bit of time to get this incredible team together, but we could never have carried it out without each and every one of them working together. I also need to thank our wonderful group of regular volunteers at Eye of the Storm for helping to make it all go so smoothly. Steve, Christa, Laura, Jo, Nils, Max, Christel -- you're the best and I love you all. Below are additional photos of Faith posted June 2004. 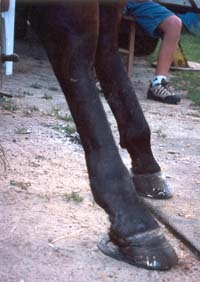 Note distorted fetlock and abcess on heel bulb. What a mess it was! Heart bar on left hoof for support as this leg carried most of her weight. Nails not yet clipped and clinched, but the hoof is firmly on the ground, now bearing weight and ready for the rest of her life! Faith in her special outdoor cabanna (14x14) two years after her injury. Big and fat and beautiful, still wearing her shoe, and limited in her movements. Our fundraising efforts are never-ending. Please, please, we are so desperate for money to care for our horses. We currently have 15 horses. Most are completely unplaceable and will be offered sanctuary for life. We care for our horses as if they were million dollar show horses. We keep them deeply bedded and feed them only the best. That is very expensive. We are 100% volunteers, none of us are paid. All donations are tax deductible. We have all the supplies we need; we just need money for feed, bedding, veterinary and farrier expenses. Please see the donation button on the left. Please see the donation button on the left to help support Gabriel and Fancy. Thank you! Please see the donation button on the left to help support Gabriel and friends. Thank you! Please see the donation button on the left to help support Fancy and friends. Thank you!